Neomycin and polymyxin B sulfates and bacitracin zinc with hydrocortisone acetate ophthalmic ointment is a sterile antimicrobial and anti-inflammatory ointment for ophthalmic use. Each gram contains: neomycin sulfate equivalent to 3.5 mg neomycin base, polymyxin B sulfate equivalent to 10,000 polymyxin B units, bacitracin zinc equivalent to 400 bacitracin units, hydrocortisone acetate 10 mg (1 %), in a white petrolatum and mineral oil base. Corticosteroids suppress the inflammatory response to a variety of agents and they probably delay or slow healing. Since corticosteroids may inhibit the body's defense mechanism against infection, concomitant antimicrobial drugs may be used when this inhibition is considered to be clinically significant in a particular case. When a decision to administer both a corticosteroid and antimicrobials is made, the administration of such drugs in combination has the advantage of greater patient compliance and convenience, with the added assurance that the appropriate dosage of all drugs is administered. When each type of drug is in the same formulation, compatibility of ingredients is assured and the correct volume of drug is delivered and retained. The relative potency of corticosteroids depends on the molecular structure, concentration, and release from the vehicle. The anti-infective components in neomycin and polymyxin B sulfates and bacitracin zinc with hydrocortisone acetate ophthalmic ointment are included to provide action against specific organisms susceptible to it. 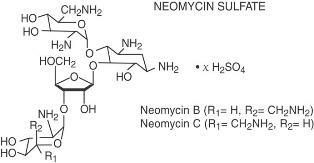 Neomycin sulfate and polymyxin B sulfate are active in vitro against susceptible strains of the following microorganisms: Staphylococcus aureus, streptococci including Streptococcus pneumoniae, Escherichia coli, Haemophilus influenzae, Klebsiella/Enterobacter species, Neisseria species, and Pseudomonas aeruginosa. The product does not provide adequate coverage against Serratia marcescens (see INDICATIONS AND USAGE). Neomycin and polymyxin B sulfates and bacitracin zinc with hydrocortisone acetate ophthalmic ointment is indicated for steroid-responsive inflammatory ocular conditions for which a corticosteroid is indicated and where bacterial infection or a risk of bacterial infection exists. Ocular corticosteroids are indicated in inflammatory conditions of the palpebral and bulbar conjunctiva, cornea, and anterior segment of the globe where the inherent risk of corticosteroid use in certain infective conjunctivitides is accepted to obtain a diminution in edema and inflammation. They are also indicated in chronic anterior uveitis and corneal injury from chemical, radiation, or thermal burns, or penetration of foreign bodies. The use of a combination drug with an anti-infective component is indicated where the risk of infection is high or where there is an expectation that potentially dangerous numbers of bacteria will be present in the eye (see CLINICAL PHARMACOLOGY: Microbiology). The particular anti-infective drugs in this product are active against the following common bacterial eye pathogens: Staphylococcus aureus, streptococci, including Streptococcus pneumoniae, Escherichia coli, Haemophilus influenzae, Klebsiella/Enterobacter species, Neisseria species, and Pseudomonas aeruginosa. The product does not provide adequate coverage against Serratia marcescens. Neomycin and polymyxin B sulfates and bacitracin zinc with hydrocortisone acetate ophthalmic ointment is contraindicated in most viral diseases of the cornea and conjunctiva including: epithelial herpes simplex keratitis (dendritic keratitis), vaccinia and varicella, and also in mycobacterial infection of the eye and fungal diseases of ocular structures. Neomycin and polymyxin B sulfates and bacitracin zinc with hydrocortisone acetate ophthalmic ointment is also contraindicated in individuals who have shown hypersensitivity to any of its components. Hypersensitivity to the antibiotic component occurs at a higher rate than for other components. NOT FOR INJECTION INTO THE EYE. Neomycin and polymyxin B sulfates and bacitracin zinc with hydrocortisone acetate ophthalmic ointment should never be directly introduced into the anterior chamber of the eye. Ophthalmic ointments may retard corneal wound healing. Prolonged use of corticosteroids may result in ocular hypertension and/or glaucoma, with damage to the optic nerve, defects in visual acuity and fields of vision, and in posterior subcapsular cataract formation. Prolonged use may suppress the host immune response and thus increase the hazard of secondary ocular infections. Various ocular diseases and long-term use of topical corticosteroids have been known to cause corneal and scleral thinning. Use of topical corticosteroids in the presence of thin corneal or scleral tissue may lead to perforation. Acute purulent infections of the eye may be masked or enhanced by the presence of corticosteroid medication. If these products are used for 10 days or longer, intraocular pressure should be routinely monitored even though it may be difficult in uncooperative patients. Corticosteroids should be used with caution in the presence of glaucoma. Intraocular pressure should be checked frequently. The use of corticosteroids after cataract surgery may delay healing and increase the incidence of filtering blebs. Use of the ocular corticosteroids may prolong the course and may exacerbate the severity of many viral infections of the eye (including herpes simplex). Employment of corticosteroid medication in the treatment of herpes simplex requires great caution; frequent slit lamp microscopy is recommended. Topical antibiotics, particularly neomycin sulfate, may cause cutaneous sensitization. A precise incidence of hypersensitivity reactions (primarily skin rash) due to topical antibiotics is not known. The manifestations of sensitization to topical antibiotics are usually itching, reddening, and edema of the conjunctiva and eyelid. A sensitization reaction may manifest simply as a failure to heal. During long-term use of topical antibiotic products, periodic examination for such signs is advisable, and the patient should be told to discontinue the product if they are observed. Symptoms usually subside quickly on withdrawing the medication. Applications of products containing these ingredients should be avoided for the patient thereafter (see PRECAUTIONS: General). General: The initial prescription and renewal of the medication order beyond 8 grams should be made by a physician only after examination of the patient with the aid of magnification, such as slit lamp biomicroscopy and, where appropriate, fluorescein staining. If signs and symptoms fail to improve after two days, the patient should be re-evaluated. As fungal infections of the cornea are particularly prone to develop coincidentally with long-term corticosteroid applications, fungal invasion should be suspected in any persistent corneal ulceration where a corticosteroid has been used or is in use. Fungal cultures should be taken when appropriate. If this product is used for 10 days or longer, intraocular pressure should be monitored (see WARNINGS). 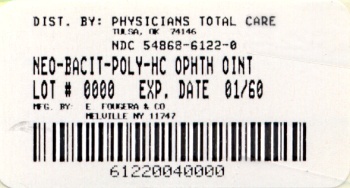 There have been reports of bacterial keratitis associated with the use of topical ophthalmic products in multiple-dose containers which have been inadvertently contaminated by patients, most of whom had a concurrent corneal disease or a disruption of the ocular epithelial surface (see PRECAUTIONS: Information for Patients). Allergic cross-reactions may occur which could prevent the use of any or all of the following antibiotics for the treatment of future infections: kanamycin, paromomycin, streptomycin, and possibly gentamicin. Information for Patients: If inflammation or pain persists longer than 48 hours or becomes aggravated, the patient should be advised to discontinue use of the medication and consult a physician. This product is sterile when packaged. To prevent contamination, care should be taken to avoid touching the tip of the tube to eyelids or to any other surface. The use of this tube by more than one person may spread infection. Store at 15°-25°C (59°-77°F). Keep out of the reach of children. Carcinogenesis, Mutagenesis, Impairment of Fertility: Long-term studies in animals to evaluate carcinogenic or mutagenic potential have not been conducted with polymyxin B sulfate or bacitracin. Treatment of cultured human lymphocytes in vitro with neomycin increased the frequency of chromosome aberrations at the highest concentrations (80 Î¼g/mL) tested; however, the effects of neomycin on carcinogenesis and mutagenesis in humans are unknown. Long-term studies in animals (rats, rabbits, mice) showed no evidence of carcinogenicity or mutagenicity attributable to oral administration of corticosteroids. Long-term animal studies have not been performed to evaluate the carcinogenic potential of topical corticosteroids. Studies to determine mutagenicity with hydrocortisone acetate have revealed negative results. Polymyxin B has been reported to impair the motility of equine sperm, but its effects on male or female fertility are unknown. No adverse effects on male or female fertility, litter size, or survival were observed in rabbits given bacitracin zinc 100 gm/ton of diet. Long-term animal studies have not been performed to evaluate the effect on fertility of topical corticosteroids. Pregnancy: Teratogenic Effects: Pregnancy Category C. Corticosteroids have been found to be teratogenic in rabbits when applied topically at concentrations of 0.5% on days 6 to 18 of gestation and in mice when applied topically at a concentration of 15% on days 10 to 13 of gestation. There are no adequate and well-controlled studies in pregnant women. Neomycin and polymyxin B sulfates and bacitracin zinc with hydrocortisone acetate ophthalmic ointment should be used during pregnancy only if the potential benefit justifies the potential risk to the fetus. Nursing Mothers: It is not known whether topical administration of corticosteroids could result in sufficient systemic absorption to produce detectable quantities in human milk. Systemically administered corticosteroids appear in human milk and could suppress growth, interfere with endogenous corticosteroid production, or cause other untoward effects. Because of the potential for serious adverse reactions in nursing infants from neomycin and polymyxin B sulfates and bacitracin zinc with hydrocortisone acetate ophthalmic ointment, a decision should be made whether to discontinue nursing or to discontinue the drug, taking into account the importance of the drug to the mother. Pediatric Use: Safety and effectiveness in children have not been established. Adverse reactions have occurred with corticosteroid/anti-infective combination drugs which can be attributed to the corticosteroid component, the anti-infective component, or the combination. The exact incidence is not known. Reactions occurring most often from the presence of the anti-infective ingredient are allergic sensitization reactions including itching, swelling, and conjunctival erythema (see WARNINGS). More serious hypersensitivity reactions, including anaphylaxis, have been reported rarely. The reactions due to the corticosteroid component in decreasing order of frequency are: elevation of intraocular pressure (IOP) with possible development of glaucoma, and infrequent optic nerve damage; posterior subcapsular cataract formation; and delayed wound healing. Secondary Infection: The development of the secondary ocular infection has occurred after use of combinations containing corticosteroids and antimicrobials. Fungal and viral infections of the cornea are particularly prone to develop coincidentally with long-term applications of a corticosteroid. The possibility of fungal invasion must be considered in any persistent corneal ulceration where corticosteroid treatment has been used (see WARNINGS). Local irritation on installation has been reported. If signs and symptoms fail to improve after two days, the patient should be re-evaluated (see PRECAUTIONS). Apply the ointment in the affected eye every 3 or 4 hours, depending on the severity of the condition. Not more than 8 grams should be prescribed initially and the prescription should not be refilled without further evaluation as outlined in PRECAUTIONS above.